Admiral Kris Longknife should have known the job offer was too good. Really, she knew by now that what was too good to be true really, really isn't. Still, she jumped at the chance to be the first human emissary to the Iteeche Empire. Only when she got there, and met the Emperor, a teenage kid swamped by his throne, did Kris find out that there was a little civil war going on in the Iteeche Empire. 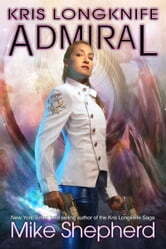 The loyal forces were losing, and they needed the best fighting admiral they could get. So, they got Kris Longknife. Now Kris is sweating out collecting a fighting force -- that won't make her their first target. Now she's trying to figure out how to fight ships identical to hers, that outnumber her four to one or worse. Oh, and she's got to keep the merchant princes in her embassy from making a mess of everything. A whole lot of people are hoping this Longknife can pull a grizzly bear out of her hat. A whole lot of other Iteeche are hoping the bear takes off her arm. This continuation of the Longknife Saga is 112,000 words of battle, intrigue and assassinations including a few wrong turns on Kris's part. Enjoy! While the story line and plot continue, there has been a marked deterioration in the proof reading of the e-book series: incorrect spellings, misplaced words, even missing punctuation such as the period at the end of a sentence. I enjoy the series quite a bit, but am having a hard time accepting the minor faults while reading.